A 10-year-old boy presented with mildly irritating black material in the right sole. It was gradually migrating few centimeters over a period of 10 days. 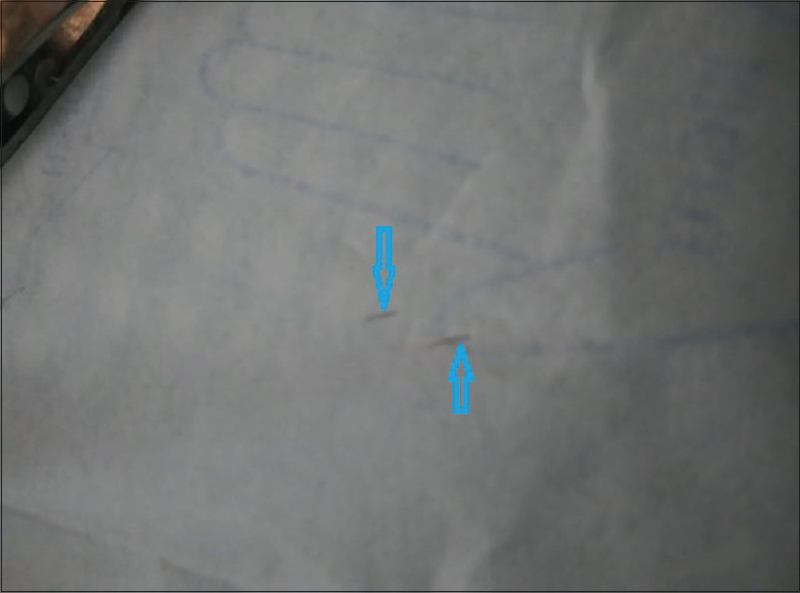 On examination, a thin, black material resembling hair shaft was seen embedded below the skin [Figure 1]. The black material was more visible after local anesthesia was injected [Figure 2]. Initially, a 23G needle was used near the center to remove the material, but it broke into two pieces. Hence, a slit was made parallel to the black material with a 23G needle, and it was extracted using small forceps. It was found to be a hair shaft [Figure 3]. Dermoscopy was not done. 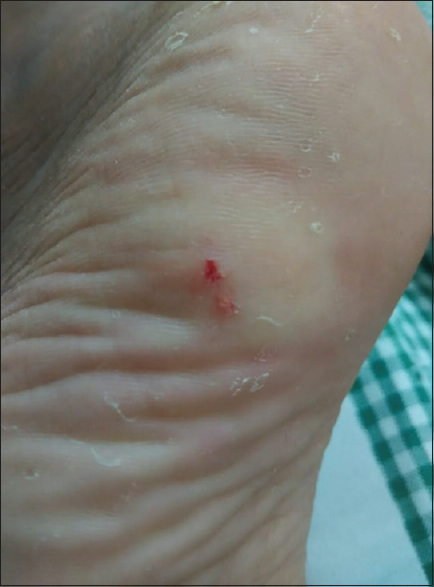 There was very minimal bleeding immediately after removal [Figure 4]. Cutaneous pili migrans is a rare skin condition, in which the hair shaft fragment is embedded and migrates in the superficial skin. It was first reported in 1957 by Yaffee. Since 1957, 27 cases of cutaneous pili migrans have been described using various terms such as burrowing hair, creeping hair, migrating hair, and embedded hair. Only two cases are reported from India. Various locations such as the ankle, sole, toe, breast, cheek, neck, jaw, abdomen, and leg have been reported. Hair penetrates the skin owing to sharp hair tip or due to the broken epidermis at the point of entry of hair shaft. The removal of the hair shaft heals the lesion completely. It is more common among barbers. Asian hair has high tensile strength and the largest cross-sectional area compared to that of all other ethnic groups. This may be the reason for more cases reported from East Asian countries. Sometimes, hair embedded in the skin is found immobile. This may be called cutaneous embedded hair. If the hair migrates, the term cutaneous migrans is more suitable. Yaffee HS. Imbedded hair resembling larva migrans. AMA Arch Derm 1957;76:254. Kim YH, Kim JI, Hwang SH, Min JH, Chae SW, Lee SJ, et al. Cutaneous pili migrans. Ann Dermatol 2014;26:534-5. Khare S, Sengar SS. Cutaneous pili migrans: A creeping eruption like condition easy to diagnose and cure. Med J Armed Forces India 2016;72:97-8. Luo DQ, Liu JH, Huang YB, He DY, Zhang HY. Cutaneous pili migrans: A case report and review of the literature. Int J Dermatol 2009;48:947-50. Franbourg A, Hallegot P, Baltenneck F, Toutain C, Leroy F. Current research on ethnic hair. J Am Acad Dermatol 2003;48:S115-9.